Our story of Florence Killilea starts on January 23, 1929, but of course her story starts 26 years before that. On January 7, 1929, Henry Killilea, counsel for the Milwaukee Railroad, suffered a heart attack in his office in the Majestic Building on 2nd and Wisconsin Avenue, and was taken to Milwaukee Hospital at North 22 Street and Kilbourn Avenue. Mr. Killilea took a turn for the worse when he developed cerebral embolus, resulting in the paralysis of his right side on January 17. That day his daughter, Florence, took a room at the hospital and stayed with her father constantly until he passed about at 10:17 a.m. on January 23. This concerns us because Henry Killilea was a baseball man through and through. With his brother Matt, he had owned the Western League Milwaukee Brewers in the 1890s and the Boston Red Sox from 1903 through 1904, watching his team win the very first World Series. In 1901, he had co-founded the American League with a series of meetings beginning with one in the living room of his Milwaukee home. More recently, Henry had become the owner and president of the Milwaukee Brewers Baseball Club, having purchased it for $280,000 from Mrs. Idabel Ruby Borchert on January 3, 1928, following her husband Otto's death. At the time Henry announced it was a closed corporation, only family members owning stock. Who would take over the club after Henry's death was not clear. It was thought Mr. Killilea desired his daughter to take over the club, but friends reported she had no great desire to have an active role in the team's affairs. The 26-year old Florence was a graduate of the University of Wisconsin, a member of Sigma Kappa sorority, and a leader among the younger social set in Milwaukee. But she was her father's daughter, and consequently no stranger to the baseball world. Florence herself was serving as secretary of the Brewers, making her very familiar with the business side of the game. Having attended many games with her father, who explained its finer points to his devoted daughter, Florence was also familiar with the game on the field. If the club was put on the market it was certain there would be no lack of interest in it, and would bring in more than the price Henry Killilea paid in January 1928. In the two years that Henry owned the club it was said to have made in excess of $100,000 in each season. Thus it was thought the Brewers franchise might be worth twice what it was purchased for. One person believed interested was Rogers Caldwell, a millionaire Memphis sportsman, who had recently attempted to purchase the Indianapolis club of the American Association. In the next three weeks the Brewer's attorney, Thomas E. Torphy, would be approached at least a dozen times by would-be purchasers. One of the bids was said to have come from a group of wealthy Milwaukee Athletic Club sportsmen, and another from a Chicago bank. 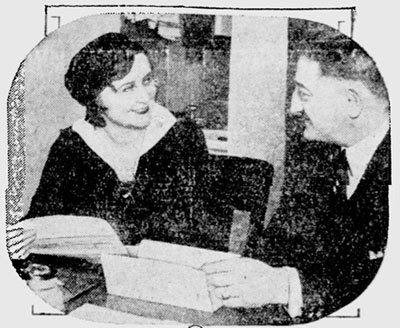 Until things were sorted out, Florence became "nominal head" of the franchise, with the other officers—brother Harry, Attorney Torphy, and Miss Elizabeth Schiffler on the board of directors. Henry Killilea's will was read and made public a week after his death. All his property (with exception of the farm in Poygan, going to his brother) and personal fortune—valued at more than $90,000—went to Florence. (For reasons not important here, Henry's son Harry was left out of the will). Thus Florence became sole owner of the baseball club, to the delight of the national press. "Indeed, I don't plan to sell the ball club. I feel that I would be doing the one thing that would hurt and disappoint my father if I were to sell the club without at least having a try at it…For him, if for no other reason, I am going to take a shot at what he wanted me to do. Maybe I'll flop, but I'm interested in making a go of it. It's a new prospect that fascinates me. And I have enough faith in the wisdom and the judgment of Louis Nahin, secretary of the club, and Manager Jack Lilivelt to know that they will help me not to make a fizzle of it." In an interview with Milwaukee Sentinel reporter Madeline L. Riley, Florence was confident and outgoing. She talked about baseball and baseball players, saying she only missed a couple early season games in 1928—being in Europe—so was very familiar with the team. In order to "assimilate something about what makes a superior player superior" she planned on going with the team to Hot Springs for spring training. Before diving into the full responsibilities of club ownership, the 26-year old young lady, who was living at the Shorecrest Hotel, planned on going to Youngstown, Ohio for a visit with friends. She planned on returning "with vigor, enthusiasm, confidence and a humble knowledge that she has a lot to learn". Her favorite baseball player? Babe Ruth. 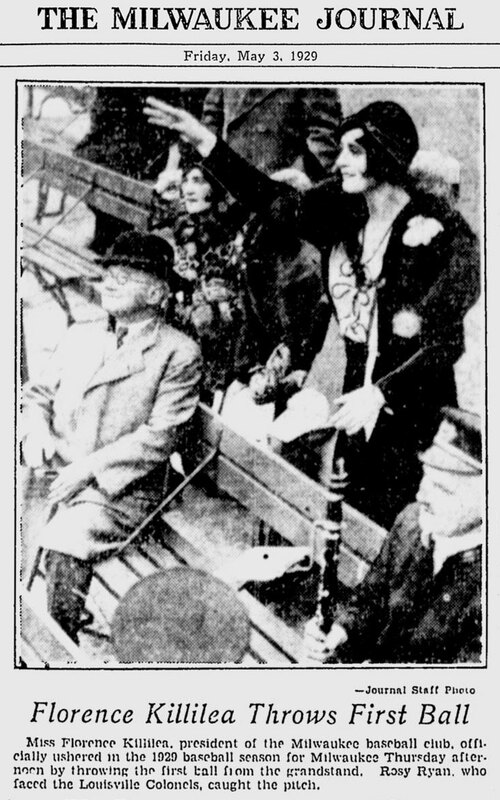 Miss Florence Killilea, president of the Milwaukee baseball club, officially ushered in the 1929 baseball season for Milwaukee Thursday afternoon by throwing the first ball from the grandstand. 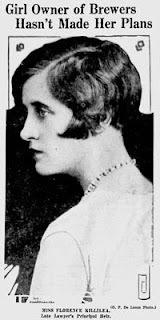 Rosy Ryan, who faced the Louisville Colonels, caught the pitch. Florence became the public face of the Brews. 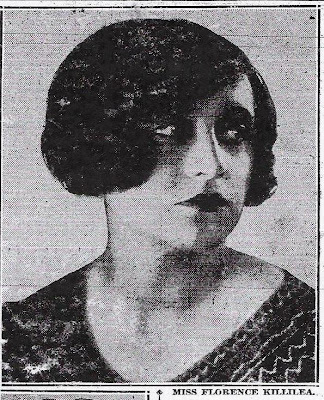 The glamorous young owner made for good copy in everything she did, whether throwing out the first pitch at Borchert Field or jumping into a mail plane to make the three-hour flight to St. Paul to take in a road game. 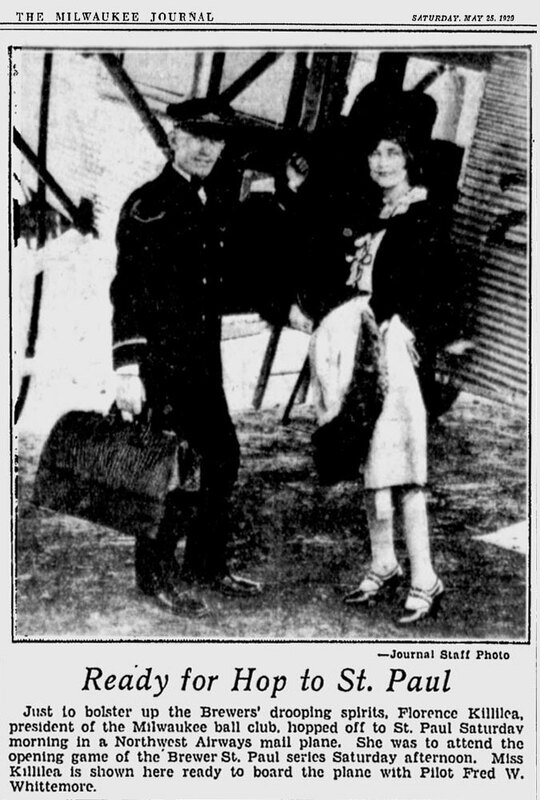 Just to bolster up the Brewers' dropping spirits, Florence Killilea, president of the Milwaukee ball club, hopped off to St. Paul Saturday morning in a Northwest Airways mail plane. She was to attend the opening game of the Brewer/St. Paul series Saturday afternoon. 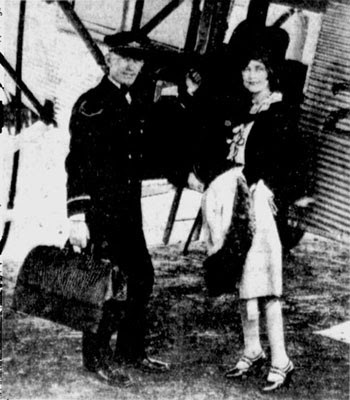 Miss Killilea is shown here ready to board the plane with Pilot Fred W. Whittemore. Maybe Florence brought them luck that day-the Brewers won that game in St. Paul 5 to 4-but she couldn't bring them nearly enough to salvage the season. The 1929 Brewers had a terrible campaign, finishing in 7th place in the Association with a 69 and 98 record. Florence, publicly at least, was nonetheless optimistic for the future. 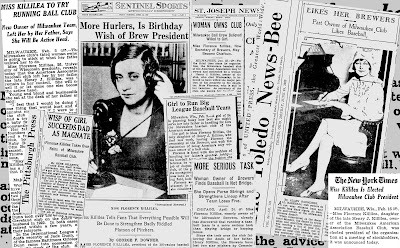 Declaring that one bad season won't make her relinquish her baseball club, Miss Florence Killilea, president and owner of the Milwaukee Brewers of the American Association, is determined to fight back and produce a winner this year. Miss Killilea's first season as president of a Class AAA ball team last year caused a serious financial strain on the Killilea pocketbook, according to Executive Secretary Louis Nahin. The above photo shows Miss Killilea discussing 1930 prospects for a first division team with Secretary Nahin. Alas, there wasn't much more "sunshine" for the 1930 edition of the Brewers than the year before. The Brews stumbled to a second consecutive 7th place finish, 63-91 for the season. 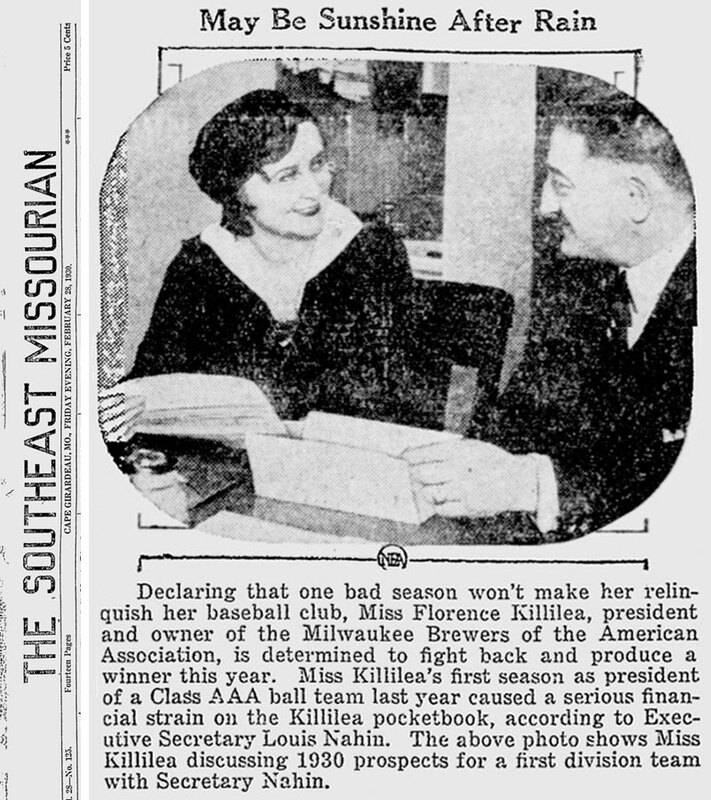 To make matters worse, the Brewers lost a reported $60,000, and Florence Killilea moved quickly to reassure Milwaukee fans by announcing a rebuilding program. As poorly as her club was performing, Florence Killilea's personal life was going great. Now living at 2527 North Stowell, on October 29 Florence announced plans to marry the prominent young physician Michael H. Boley on November 25 of that same year. Michael Boley had attended Riverside High School, where he starred in football. He then attended Marquette University medical school. After graduation he was a resident surgeon at Harper Hospital in Detroit, then the house doctor at Maternity General Hospital in Milwaukee. At this time he maintained offices in the Straus building at Third and Wisconsin. 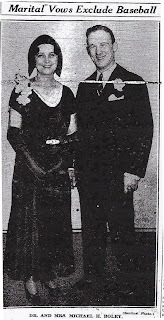 The Boley family, living at 2853 North Murray, was widely known, as Michael's sister, Ilsa, was a celebrated cellist. On that Tuesday afternoon in November before a small gathering of immediate families at Florence's home on North Stowell Avenue, Judge John C. Karel told the two young people: "A single inning suffices here, but remember, the new team has ahead of it many seasons and must overcome much opposition together." He then pronounced the couple man and wife. At this time Florence told reporters she planned on continuing to run the ball club. "I expect to continue as president of the Brewers," she said, "and why shouldn't I? Dr. Boley will continue to practice." The call of the home has lured away Mrs. Florence Killilea Boley, until today the only woman president of a baseball team, from handling the Milwaukee American Association club for another year. Not, she says, that baseball isn't the place for a woman—she expects to be in the stands this summer yelling for the Brewers—but it's merely that home comes first, now that she's married. And her physician-husband, she says, ought to have something more than a baseball fan for a wife. 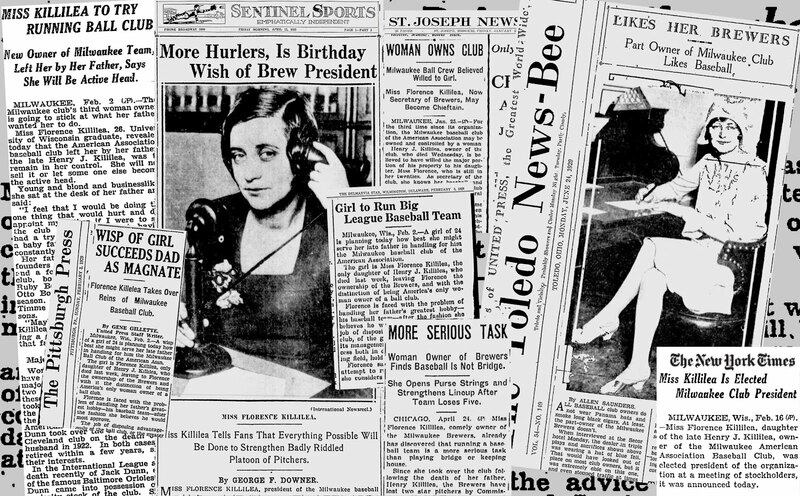 President of the Brewers for two years and a half-owner since the death of her father, Henry J. Killilea, Mrs. Boley resigned her position yesterday. Her official reason for becoming a director was that she "thought the road trips required of the president were a little too stenuous for a woman." Did you catch the contradiction there? Two separate and distinct reasons offered for her resignation; either it was to devote more time to her husband, or because the job was too strenuous. There might have been something to the latter. 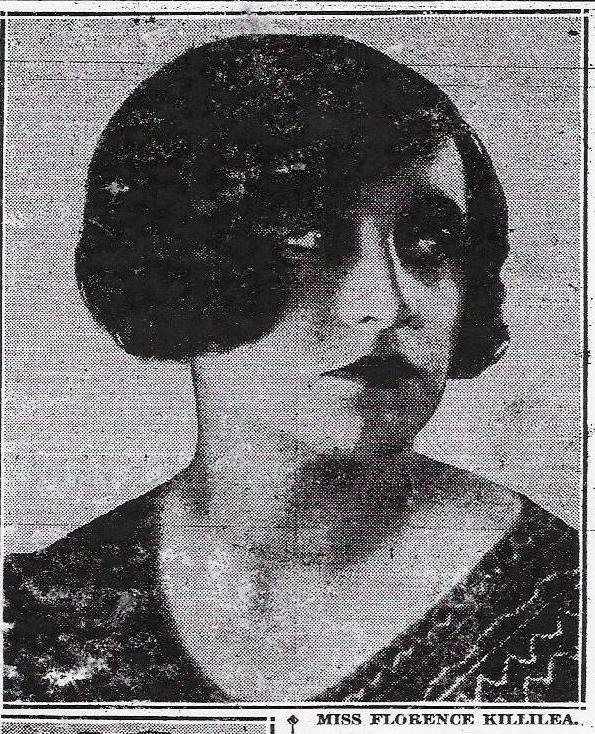 Not five months later, in late May 1931, Florence entered Milwaukee General Hospital suffering from a blood infection. Two weeks later, her condition took a turn for the worse when pneumonia developed. After treatment, including three blood transfusions to sustain her strength, Mrs. Florence Killilea Boley suffered a heart attack and passed away on June 15, 1931, at the age of 29. Florence's burial was set for two days later at Calvary Cemetery on West Bluemound Road, in the family plot. The Brewers were in Toledo at the time, and the game was called off to allow team members to return to Milwaukee. Florence had been well liked by the players. Pitcher Denny Gearin, who knew her longer than any of the other players, said "She was 100 per cent…We played for mostly Florence in 1929 and 1930. The players knew that the team wasn't strong enough to make much of a showing but we tried to win for her sake, because we admired her, loved her ever genial personality and knew that if we could get some place in the race it would help her in several ways." First baseman Art Shires told the press: "Florence was 'regular' in every sense of the word….Her marvelous personality won me over the first time I saw her and I know that I and the rest of the boys were playing for her as much as anything else. I liked Florence." Brewer manager Marty Berghammer said: "Florence was a marvelous character. She had mostly troubles in her two years as president but she was always sweet, always saw the brighter side of any difficulty and was an inspiration to me and the players." 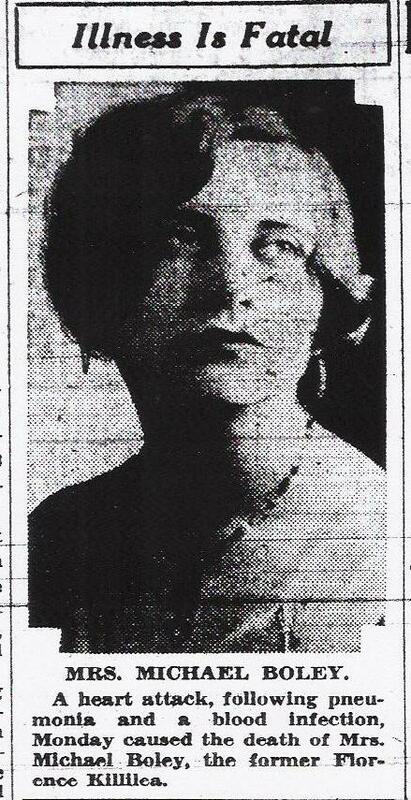 I think Florence would have appreciated this paragraph the Milwaukee Sentinel had to say about her the most. 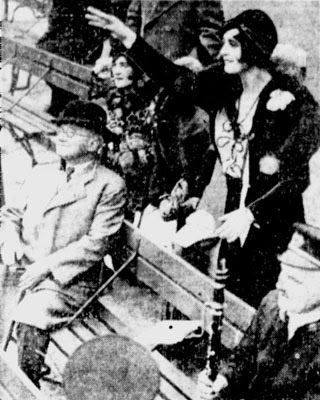 Florence made a number of trips with the ball club while she was president and there was never any of the aloofness her position might have demanded. She was 'one of the boys.' She was particularly fond of bridge, and any time a fourth hand was needed Florence was usually appealed to and always accepted. It might have meant playing in a dingy day coach, with a cumbersome, dirty cushion, defiling an imported gown, but she was happy then. Florence was a good sport. She was one of the boys". I like to imagine this pretty young girl, born into wealth and privilege, sitting with the boys, overhearing stories not meant for her ears, winning (and losing) a few bucks at cards, and enjoying every minute of it—just like her father had wanted her to do. An amazing, touching and tragic story of a true Milwaukee heroine, done so superbly by Mr. Pajot. Man, I'd have dated her in a heartbeat! I'm sure she was quite something else to get to know. A sad chapter in the long history of Milwaukee's greatest ball club.